LIT Instructors are QUALIFIED, skilled artists and directors with extensive knowledge of the theatre industry at ALL levels. Each instructor is required to pass a mandatory background check and has a PASSION for teaching and performing arts. Deborah Lynn Armstrong was born and raised in Lincoln, IL, and first performed on stage at the age of 5, playing a Munchkin in a production of the Wizard of Oz at the college where her parents taught. She began studying music in kindergarten, and directed her first play in the 3rd grade, continuing to be very active in both theater and music throughout her school years. Before she graduated from High School she had been the Assistant Director for multiple school productions, and the Student Conductor for both Band and Choir. Deborah attended Lincoln Christian University, receiving a double BA in Music (Piano and Composition) with a minor in Voice and Youth Ministry. Deborah moved to Tacoma in 1995, and began her career in theatre in 1996, working all over the South Sound region as a “Theatre Professional.” She became the Production Manager for Lakewood Institute of Theatre at Lakewood Playhouse in late 2014, was promoted to the Director of Education in late 2017. Before her position as LIT’s PM and Ed. Director, she has also been a Stage Manager at both Taproot Theatre (Seattle) and Harlequin Productions (Olympia), a Production Assistant and Child Wrangler at ACT Theatre (Seattle), taught both acting and musical theater at Taproot, Lakewood, and Studio East (Kirkland), was a Puppeteer for Pierce County Library System, and taught music at Highline Community College and Tacoma Community College. Deborah has been a Musical Director for past productions of Oliver!, Monty Python’s Spamalot, The Mystery of Edwin Drood, The Pirates of Penzance, and Green Day’s American Idiot at Lakewood Playhouse. She has also been a Music Director at Harlequin and Centerstage Theatre (Federal Way), Assistant Musical Director/Accompanist for Taproot, Vocal Coach for Broadway Center for the Performing Arts (Tacoma) and Accompanist for many productions and choirs in the South Puget Sound. Other theatrical positions she has held are Technical Director, Lighting Designer, Sound Designer (The Wonderful Wizard of Oz and Alice in Wonderland at Lakewood), Lead Technician, Artistic Director, Producer, and Actor. Her newest position is becoming the wife of Ed Jacobs in mid-May of 2018. In the meantime she is the Puppy-Mamma of Waffle the Wonder Dog (last seen on stage at LPH as "Toto" in The Wonderful Wizard of Oz in the Fall of 2016 - she has been wondering where her spotlight is ever since), and Ruby the Retriever (don't say "bird" near her). 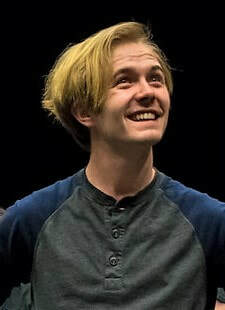 Brian Loughridge is a local actor, improvisor, and student studying Psychology, Theatre, and Music at Pacific Lutheran University. He has been on stage since he was child and has worked with Tacoma Little Theater and Tacoma Musical Playhouse in both educational programs and regular season productions. At PLU, Brian is an active member of the Clay Crows Improv Troupe and has experience in multiple improv forms including improvised musicals, Harolds, and two-person shows. Now, Brian is ecstatic to join the team over at LIT. In the last four years, Brian has taught improvisation workshops to students of all ages, performed in Seattle and internationally, and placed in the Regional Collegiate Improvisation Tournament. Having read every book and article on improvisation he can get his hands on, Brian prides himself on his knowledge and passion that he has gained for the art of improvisation. When he is not on stage or studying improv, Brian works at the local Child Study and Treatment Center in Therapeutic Recreation. He works with kids of all ages at the facility and has gotten the opportunity to apply improv in a therapeutic setting. Brian plans to become a certified Recreation Therapist and use the skills he has gained to continue to merge improv and therapy. To continue his education, Brian will be attending the national performance therapy conference “Performing the World” in New York City. Emily Cohen is a local actor, playwright, and stage combat choreographer. Originally from the Big Island of Hawai’i, she discovered her love for theatre while in high school when, on a dare, she auditioned for the school play. Emily graduated from the University of Puget Sound with a B.A. in Theatre and English (with an emphasis on creative writing). While in school, Emily dove into playwriting, acting, and discovered a passion for stage combat and has been hooked ever since. As an actor, some favorite roles include: Callie in Stop Kiss, Peter Pan in Peter Pan, Thomasina in Arcadia, Julia in The Two Gentlemen of Verona, Nina in The Nina Variations, and being a part of the ensemble shows of 365 Days / 365 Plays and Anon(ymous). Some recent projects in which she has provided stage combat choreography include, 365 Days / 365 Plays, Water by the Spoonful, and Anon(ymous). Lately Emily has been focusing on her writing, editing her second full length play, and working on a daily play project. Her first play, titled Buenas Noches Mamá was performed as a staged reading with Toy Boat Theatre. Heather Arneson is a choreographer, actress, dancer, and teaching artist in the South Sound. Heather is excited to work on her first production with Lakewood Institute of Theatre! Heather also works for Tacoma Musical Playhouse as a teaching artist/choreographer, currently choreographing Elephant & Piggie’s “We Are in a Play!”. Other choreographic credits include Children of Eden at The Evergreen Playhouse and The Lion King Jr. for CampTMP. Stage credits include Grease (Sandy), Footloose, The Little Mermaid (Atina), and Moon Over Buffalo (Roz). On top of her theatre work, Heather teaches ballet/jazz at Tacoma Urban Performing Arts Center (T.U.P.A.C.). Heather was a dancer first and has extensive dance training in ballet, contemporary, jazz, and tap. Her most recent dance credits include The Nutcracker with Ballet Northwest and Handel's Messiah with Ballet Bellevue. Heather holds a Masters in Education and loves sharing her passion for the performing arts with the community. James Venturini was born in Detroit, Michigan and has been involved in radio theatre and staged recreations of radio theatre for 38 years. He was a founding member of the Detroit Radio Workshop, and earned his first paycheck as an actor ($10!) for a recorded radio play. He produces, directs, and serves as the sound effects person for Lakewood Playhouse's annual Radio Gala, now in it's 11th year. He has a large collection of "old-time radio" sound effects equipment. James holds a BA in theatre and film production from Columbia College in Chicago, Illinois, where he spent 8 years in its vibrant theatre scene before moving to Seattle in 1990. He co-founded and was co-artistic director for A Theatre Under the Influence, one of the many storefront theatres in the '90s-'00s Seattle "fringe" theatre scene. Influence lasted for ten years and 50 productions, until its shared theatre space (The Union Garage, which James also co-founded) had to close due to the need for an earthquake retrofit. In Seattle, he also served as President of the League of Fringe Theatres, on the board of The Seattle Fringe Festival, as a contributing editor of The Actors Handbook, and as Editor-in-Chief of Northwest on Stage magazine and its sister publication Intermission. He moved to Tacoma in 2002, and worked as Tacoma Actors Guild's Production Manager until that theatre closed, at which time he took on the same duties at Lakewood Playhouse, where he is now Associate Artistic Director. James has an extensive resume as a theatrical actor, director, and playwright, as well as commercial/industrial film actor, and short film writer and director. He is a published playwright and magazine article author. He lives with his wife and teenage daughter in Tacoma's North Slope neighborhood. Bio and picture to come - check back soon! Jenifer King has been teaching drama, music and dance to kids from 3-50 since 1985 in New York and the Seattle-Puget Sound area. Jen has worked with LIT since 2015, and directed the wonderful Into The Woods Jr, Pirates of Penzance, Guys and Dolls Jr., and co-directed/choreographed Sweeney Todd. She was one of the two founders of the Tacoma Musical Playhouse youth program, and has had students on Broadway and in feature films. Jen has been a Master Teaching Artist with the Broadway Center LENS program in the public schools, and teaches workshops all over Puget Sound. Jen is a lifelong triple threat performer and a professional stage manager. She has also been the drama and dialect coach at Gig Harbor High School, in addition to teaching with LIT. In the summer of 2017 Jen moved to Las Vegas to complete a 2-year teaching fellowship with the Nevada Teacher Corps, but will return during the summers to continue teaching at LIT. Jennifer Niehaus-Rivers is a theatre educator, actress, singer, director, and stage manager. In the past 20 years, she has taught or performed at Lakewood Playhouse, Tacoma Little Theatre, Tacoma Musical Playhouse, and Auburn Avenue Theatre. She taught and directed The Secret Case of Sherlock Holmes for Lakewood Institute of Theatre in 2016. Jennifer teaches Dramatic Arts at Lowell Elementary School in Tacoma. She was recently an evaluator for the 5th Ave High School Musical Awards, and enjoyed traveling all over Washington to see some of best high school productions in the state. Jennifer is on the Board of Tacoma Little Theatre, and is the Advisor for Club TLT, a unique club focused on training teenagers in theatre arts. Jennifer was the Drama Director at St. Patrick School (2009 – 2014), where she taught Drama in the middle school, and directed the school musicals, including Into The Woods, Jr., Peter Pan, and Bye Bye Birdie. In 2017, she directed The Wizard of Oz at St. Charles Borromeo School, and I Hate Shakespeare for Club TLT at Tacoma Little Theatre. Jennifer is one of the co-founders of the Tacoma Musical Playhouse youth program with Jenifer King. Her directing and stage manager credits include the musicals Jungle Book, Godspell, Pirates of Penzance Jr., Grease (School Edition), Music Man, Jr., and the dramas Looking Glass Land and To Kill A Mockingbird, and the comedies A Flea In Her Ear, Sylvia, and Vanya, Sonia, Masha and Spike. Jennifer directed the Pacific Northwest premiere of the original teen musical Like You Like It at Tacoma Little Theatre in 2016. Originally from Sammamish, Jennifer has lived in Tacoma for 22 years with her husband Michael. Their son Dylan is a 2018 graduate of Bellarmine Preparatory School. John has been a Seattle actor for many years in addition to being an actor/combatant and Stuntman. He has certified in all 8 weapons with The Society of American Fight Directors. He is an active member of the SAFD since 1997 and has just recently become the North West regional representative for the SAFD. He has trained with The American Stuntman’s Association in 2002, in addition to training with The British Academy of Stage and Screen, London in 2008. John has most recently attended Combat con Las Vegas and Winter Wonderland Chicago stage combat training, where as well as honing his skills in combat he received training in intimacy choreography. In addition John helped found and serves as co-artistic director for the Theatrical fight group Performers Forge. John has taught stage combat for Seattle Children’s Theater acting intensive and for the North Shore School district. John has choreographed fights for many local theaters. Those include Driftwood Theater, Burien Actors Theater, Renton civic, Snoqualmie Forest theater, Everett Historic, West of Lennon Theater, Green Stage, Seattle Gilbert and Sullivan, Recycled Shakespeare Theater and Seattle Musical Theater to name a few. John Munn is celebrating his 35th year in theatre in 2018 having started with the young actors program at Tacoma Little Theatre, when he was eight years old, by his mother who thought he had too much energy. He graduated from Charles Wright Academy in 1984, and received a BA in Theatre from Pacific Lutheran University in 1997. He has appeared as an actor in forty plays, including last Season’s THE PIRATES OF PENZANCE at the Lakewood Playhouse. John has also directed forty-six productions including AMERICAN IDIOT and PETER AND THE STARCATCHER, both for the 79th Season at the Lakewood Playhouse. In February of this year, he will begin his eighth year as the Managing Artistic Director of the Lakewood Playhouse theatre and the Board there has just extended his contract for another five years until 2021. He is an active member of Clover Park Rotary, Lakewood Kiwanis, Theatre Puget Sound, the American Association of Community Theatres and the Stage Directors & Choreographers Society of America. John grew up in Michigan and was introduced to theatre in High School. He immediately participated in his local community theatre and was inspired to learn all aspects of Theatrical Arts. After graduation from Western Michigan University he pursued a career in the performing arts. He has the opportunity to work at the Kalamazoo Civic Theatre, one of the largest Community Theatres in the country, as their Volunteer Coordinator/Educational Director. In 1990 John was hired by the Lakewood Playhouse as their first Artistic Director where he produced over 3- productions in a five year period. He designed all but two shows, directed a lion's share of the productions and taught a s series of adult acting studios. After leaving the Lakewood Playhouse John pursued professional opportunities working as an actor (both stage and commercial), director, and scenic designer. In 2010 John received an MFA from Minnesota State University, Mankato where he taught acting courses as part of his assistantship. He had the opportunities to teach at Southwestern Minnesota State University and Gustavus Adolphus College, both in Minnesota, while his talented wife Patricia was the Prop Master at the Guthrie Theatre. John is very happy to be back in the Puget Sound are and excited to be back at the Lakewood Playhouse where he will be directing next season's opening production of Brighton Beach Memoirs. Kathryn Philbrook is an Actor, Director, and Stage Manager in the South Puget Sound region. She studied at the University of Puget Sound, earning a Bachelor of Arts in Theater and English Literature, and wrote her Honors Thesis on Lady Gregory’s play “Grania”. She has since continued to study acting in workshops by Marilyn Bennet, Adam Utley, Brian Jansen, and Tony Doupe. As a performer, Kathryn has been seen onstage with a variety of community, semi-professional and fringe troupes in the area, including Studio 21, Tacoma Little Theater, Shakespeare in the Parking Lot, Lakewood Playhouse, Harlequin Productions, Dukesbay Productions, Tacoma Actors Repertory Theater, and New Muses. Favorite roles have included Masha in “The Seagull”, Curley’s Wife in “Of Mice and Men”, Beatrice in “Much Ado About Nothing,” Agnes in “She Kills Monsters”, and Martha in “Piece of My Heart”. Kathryn has also been in a variety of short and independent films, some local commercials, a couple of television pilots, and has done voice over work for the Oregon State Capitol Museum and Amazon. Kathryn’s first Stage Management position was for a Tacoma Little Theater youth summer camp production of Alice in Wonderland, directed by Marcus Walker. Since then, she has gone on to Stage Manage for the Broadway Center for the Performing Arts for “Joe Turner has Come and Gone,” “Ain’t Misbehavin’” and “The Best Holiday Christmas Special”. She has also directed “Stella Swift Vanessa” by Tom MacIntyre, and Aeschylus’ “Agamemnon”, which was also self-produced. She recently directed another self-produced venture of “Richard II”, and played Lady Macbeth in Tacoma Little Theatre's production of the Scottish Play. LaNita Hudson Walters is a well know actor in the Puget sound. She has performed in several venues including Lakewood Playhouse. You may have recently seen her as the Cheshire Cat, the Gryphon and the White Rabbit in Lakewood's Production of Alice in Wonderland. When she is not performing she enjoys teaching and directing. Her love of children started 25+ years ago helping in her grandmothers daycare center and then being her mother's assistant in hers. After studying at Berkley music college she returned home and started at family. In 2000 she started working at Grant Elementary School of the performing arts as the enrichment Glee club teacher which she named Superstar 101. As the program grew she became the Enrichment coordinator as well as continuing teaching the Glee Club, Hip hop and creative dance classes. After 13 yrs at Grant and watching all 4 of her children graduate from elementary she also moved on. For the last 3 years she has been working as a Master Teacher Artist for the Broadway Center where she has directed summer camp programs, taught workshops and taught the Lens program that is a 10 week course which teaches life skills through the arts at various schools in the Bethel and Tacoma School District. During the school breaks she divides her time directing programs at both Lakewood Playhouse and The Broadway Center. And because that just isn't enough teaching for her soul, LaNita also gives private voice lessons for children ages 18 and under. LaNita is extremely excited for another year with both theaters and can't wait to share her love and passion of the arts with more of today's youth. Leslie Dymond was exposed to performance arts at a young age. At 4 she thought she would grown up to be Ann Miller, by 5 she was positive she would marry Gene Kelly and by 6 she started ballet classes with the Royal Academy of Dance. She attended dance master classes and dance internships in California (State Street Ballet) Texas (Greenspace Arts Collective, Ballet Concherto, Texas Ballet Theater, Dallas Metropolitan Ballet) and in England (English National Ballet). In 2009 Leslie began her study of East Cost Swing Dancing or Lindy Hop and since then has been invited to perform and teach all over the USA! Her study of theater began while at The University of North Texas. She wanted to offer dance, theater and improvisation classes to anyone who had the passion but may have been limited by financial means. In 2012 she created Black Fox Players (Denton, Tx) a non-profit youth theater company. Acting as playwrite, costume master, props and set designer, director and stage manager all on a budget of $0.00! Leslie held regular classes and summer intensives until she moved from Texas in late 2015. While Black Fox continues in Denton, Leslie has been able to colaborate with Utah Children's Theater (Salt Lake City) and now The Lakewood Institute of Theater! Leslie is excited to start this journey at LIT! Michael Crowley is a native of Missoula, Montana but has called the Seattle area home since 1988. After a childhood influenced by the sword work of Zorro, Robin Hood, and John Carter of Mars, he was finally introduced to stage fighting during a 1992 production of “Cyrano de Bergerac”, in which the fateful words, “It’ll look good on your resume!” were uttered and, thus, off to classes he went, where he was promptly, and well and truly, bitten by the swashbuckling bug. He proceeded to study stage combat with Society of American Fight Directors-certified instructors such as Geoff Alm and Robert Macdougall for the next five-and-a-half years, including one-time workshops with Drew Fracher and Dale Girard, and has held certifications in seven of the eight weapons disciplines that the SAFD offers as both an actor/combatant and a recommended/recognized actor combatant. He is a current SAFD member, and was most recently seen as Cardinal Richelieu in Greenstage’s production of “The Three Musketeers”, where he also served as the production’s fight captain as well as being a utility fighter. Before that, his work as a teacher, performer, and fight director has been seen at: Edmonds Community College; Seattle Pacific University; Act One Theater; True Edge Theater; Tacoma Musical Playhouse; Lakewood Institute of Theater; Briarwood Christian School; the Wing Luke Museum’s “So You Think You Know Bruce?” exhibit; and in the anthology film “Hobo With A Trashcan”. To further his understanding of how a sword is used in earnest, Michael has also studied sport fencing for two years (foil and epee) with Salle Auriol Seattle and has been privileged, for the last 19 years, to be a student of the Jun Fan Gung Fu Institute of Seattle under the instruction of Sigung Taky Kimura and his son Sifu Andrew Kimura. He is currently recognized as a senior student and has assisted with seminars and class instruction. Michael is honored to have been asked to share what he knows and has learned in his years of experience as a fighting actor, as a student of martial art, and as a teacher with the students of Lakewood Institute of Theatre. Bio to come - check back soon! Pamela Roza recently relocated to the Pacific Northwest from South Florida where she taught at the prestigious New World School of the Arts, featured last year in the New York Times and whose alumni include Tarrell Alvin McCraney (Oscar for Moonlight), Alex Lacamoire (Tony Award - Hamilton), and David Del Rio (Grease:Live on FOX). Pamela, who recently made her debut at Lakewood Playhouse as Kate in Brighton Beach Memoirs, has been a professional theatre artist for going on three decades, starting back in 1991 with her first professional role as Martha in Careless Love at Area Stage Company in Miami Beach. It was Area Stage where she appeared with Oscar Isaac (Poe in Star Wars: The Last Jedi) in the world premiere of Sleepwalkers by Jorge Ignacio Cortinas. Pamela originated a second role in the world premiere of The Sunken Living Room, by David Caudle, where she played John Magaro’s (Orange is the New Black; The Good Wife) negligent mother, Lynette. John and David then graciously participated in a teleconference with Pamela’s 11th grade Scene Study class at New World, which was later featured in Samuel French’s Breaking Character Magazine. Sunken Living Room was produced at New Theatre, where the 2003 winner of the Pulitzer Prize for Drama, Nilo Cruz’s Anna in the Tropics, was produced. Sadly, New Theatre is no longer around but during its heyday Pamela was a regularly featured player, appearing in numerous roles which ranged from Harper in Tony Kushner’s epic Angels in America to Estelle in Jean-Paul Sartre’s No Exit. Pamela also made frequent appearances at GableStage in the world famous Biltmore Hotel in Coral Gables, winning a Miami New Times Best Actress Award for her performance in Boy Gets Girl. She also performed with Actors Playhouse , Broward Stage Door Theatre, as well as with smaller experimental theatres such as Juggerknot and Mad Cat Theatre Companies. Pamela teaches the Linklater Vocal Method and focuses on a combination of Uta Hagen and Sanford Meisner in her approach to acting instruction. She is also trained in Alexander Technique and the Fitzmaurice Vocal Method, although she prefers to use the Linklater when teaching voice for the stage. Her latest achievement is that she is now a registered Yoga teacher and pursuing her masters degree in Yoga Therapy. Tracy can be seen on stage all over the South Sound and truly enjoys sharing her love and passion with the next generation of artists. Bios and pictures to come - check back soon!